The convener of the colloquium, Benda Hofmeyr, holds the global economic and social plague of neoliberalism responsible for the condition of precarity. In general, what is meant by this is the increasing disappearance of the autonomous world of local economies, cultural production, cinema, publishers, and so on, as a result of the ‘neoliberal disruption of the economy’. For the arts this then implies an impoverishment and losing out of small-scale initiatives, often involving local art production, to competition. In every way, it’s a situation that needs to be actively resisted! On closer inspection, however, the book’s approach does not seem to be entirely successful. Perhaps the ambitions were too high for the amount of suffering that can effectively be shouldered. Despite all the care the editor has taken, one of the book’s rather irritating problems is that it is unable to make clear to the reader what is understood by the notion of neoliberalism. Besides this, it is particularly annoying that it lacks any practical analysis of how neoliberalism represents a death-blow to the arts and public space. Is there not something paradoxical in the fact that the arts, architecture and design have apparently been able to exist with no noticeable problems for almost 30 years under totalitarian neoliberal conditions, and that only now, of all times, is there a need for a discourse about a renewed commitment to the re-politicization of intellectual and creative work? Necessity knows no laws, it seems. Of course the practice of neoliberalism, and the concomitant sociocultural and economic transformations, are so broad, complex and comprehensive that it is difficult to formulate a satisfying definition. But the editor has made this crisis of definition even more difficult by trusting in the interdisciplinary path – apparently in the blind belief that a crossover approach could provide solace – without, however, having felt the need to explain what the conditions are for such a grand tour to operate effectively. Editorially, then, this collection of essays leaves a lot to be desired since nowhere is it explained how the various perspectives (philosophy, social geography, film theory, art and design) ultimately relate to one other. Readers are, it seems, expected to negotiate and synthesize this multiplicity of perspectives themselves. It becomes even more problematic when this same many-headed monster, partly through the link with Greenwald’s documentary, is awkwardly brought into line with the diabolical methods of the multinational Wal-Mart. The weighty question that keeps resounding throughout the entire book and is nowhere made clear is: What, then, is this ‘Wal-Mart phenomenon’? That is a pity, since despite the courageous attempt of the authors to chart the destructive influence of neoliberalism on design, public space and the arts, and how, on the basis of a creative engagement, a riposte to it could be offered, an important part of that critical potential is negated in advance, precisely because of this shortcoming. This is even more regrettable considering that, now the après nous le déluge morality of neoliberalism is imposing itself massively by means of a global financial crisis, all parties would benefit from a book that could serve as a theoretical and practical compass for suggesting a new direction. This crisis of orientation could perhaps have been avoided if the pretensions had been somewhat less and if the choice had been made to follow a theoretical path more in line with Greenwald’s film, in the tradition of tactical media and media activism. The closest we get to this is the essay by Hito Steyerl, which in fact sees conventional documentary films, like Greenwald’s, precisely as a neoliberal, unproblematic representation of reality, and talks about a ‘wal-martization of the documentary form’. Yet the perspective in this actually too short essay continues to adhere too much to the conventional practice of art theory, where an overkill of theoretical references and views prevents it from really getting down to initiating an alternative practice of tactical media. The practice in question not only feeds on a theory about subjectivization, but also actually eludes, as regards both publication and tactical effect as well as distribution, everything that Steyerl claims to be resisting. 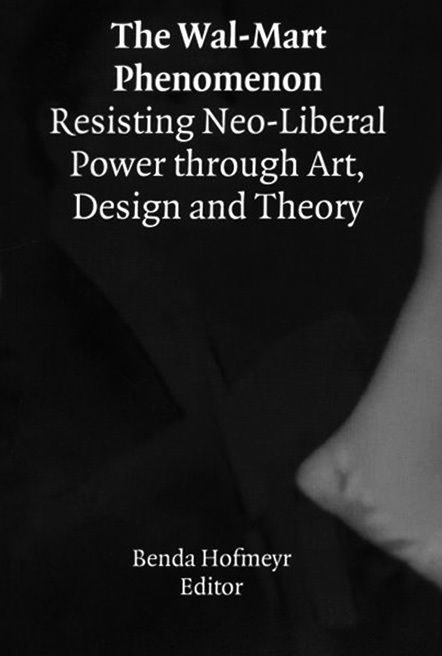 For despite all appeals for creative engagement and opposition to the spectre of neoliberalism, there is an air of despondency and a lack of imagination in many of the essays. The book is left reeking of a restless theoretical roaming in an indescribable world of text, rather than being a vital and creative appeal for action and providing an idea of a tactical practice whereby all imaginable means can be deployed, and not just text. It seems as though the writers no longer actually believe that the arts and design can really provide an adequate answer, whether conventional or activist. This hardly encouraging attitude is particularly evident in the final piece in the book, in which careful thought is given to ‘Public Art as Interruption or Anamorphosis on the Possibility of a Creative Engagement with Present-Day “Public Space”’. The title alone is enough to put the reader off and to completely extinguish any possible glimmer of hope. This is the terrain that goes beyond all ‘precarity’. The essay, based on Benda Hofmeyr’s interview with design researcher Daniël van der Velden, is subtitled ‘an interview and (in)conclusive remarks’. After the theoretical bombast of the preceding essays, the hesitant and not particularly determined tone that throbs in these introductory qualifications makes it clear immediately that an apologetic and patent disorientation lies at the bottom of the discussion. This is a cause for concern, especially when one considers that the last chapter should actually be granting us a visionary and inspiring look at a reestablishment and re-politicization of a practice that, whichever way you look at it, finds itself in a precarious position. 1. Background information can be found at: www.walmartmovie.com.